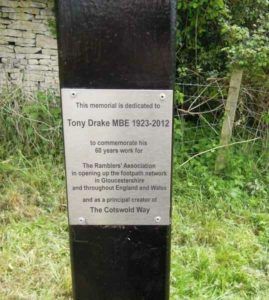 A life long Rambler, Tony dedicated his life to the development of our network of footpaths and the protection of our countryside. He was involved in the planning of several long distance paths, including the Cotswold Way, Offa's Dyke Path and the Cambrian Way. He was instrumental in the production of the Gloucestershire definitive map resulting in the recording of many, many footpaths on our OS Maps. 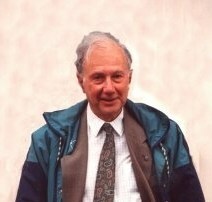 Tony was involved with and influential in many countryside organisations over his long life. He was held in high esteem for his attention to detail particularly when the definitive map was being created. People with whom he worked, including members of the then Countryside Commission and Gloucestershire Public Rights of Way Staff gathered at the ceremony in May 2013 along with representatives of other organisations, Ramblers' past Chairmen, past and present Board of Trustees members, Ramblers' Directors of Wales and Scotland and many others to remember this one off man. Tony was such a key player in the Association for so many years and we all enjoy his legacy every time we walk in the Gloucestershire countryside and elsewhere. Here he developed the mountain connoisseurs walk, the Cambrian Way, 270 miles long with 61.540 feet of ascent! He mounted the White Roads Campaign, so that walkers could know whether an uncoloured road on the map was private or a public low class road, (now shown with green dots on all Explorer maps) and thus making lots more routes available for walkers on OS maps. Look on any OS map and see if you can spot the coloured blobs! Now called ORPAs (Other Routes with Public Access). Campaigned for better stiles, gates and particularly gaps! In May 2013 people who knew Tony came from all over the country to mark Tony's passing. 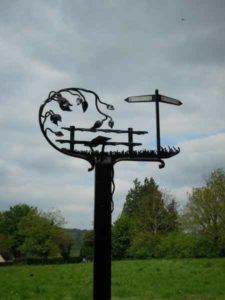 Groups of Gloucestershire Ramblers converged on Painswick from all directions. Our Group walked from Stroud for a picnic there (See Pictures). Benedict Southworth, Ramblers Chief Executive was there, as was the President Kate Ashbrook, who unveiled the memorial to Tony. Janet Davis, who had worked in the London office since the 1980's, knew Tony well, and her address gives you the full flavour of his work and personality. 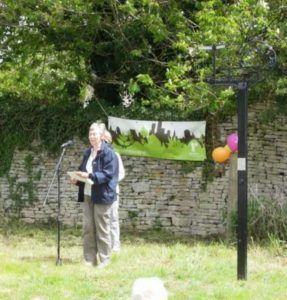 Now it is Janet Davis's turn to retire, and Kate has written a tribute to her work, Thank you Janet, the Ramblers' Rock Click HERE It includes a photo of Janet at Painswick in 2013. Janet Davis tells us her memories of Tony over many years.